I am fascinated lately with micro-games, such as Love Letter and Master Merchant, and with good reasons: they are small games that don’t have lots of components thus are easy to always have on you, they can be explained quickly and yet still pack some hard decision to take during the game. Of course, there’s always been simple games that don’t have a lot of components, but for the most part, the decision making aspects have been lacking and thus less interesting to me. The funny thing about these micro-games is that until very recently, they all came out of Japan, where board games are starting to make some inroad. I guess it makes sense: there is a distinct lack of space in the big cities so if you can make something that packs a lot in as little a package as possible, it will be a hit. The Japan trend is changing however, with games like Agent Hunter and Council of Verona having come out recently/are coming out soon. Recently, I had the chance to play another small game that seems to have a lot of potential: Suspense (more specifically, this is Prototype F). Please note that this game isn’t out yet, but it is a prototype and as such I have no idea when it is actually being published. Suspense is a 3 player micro game where the players are trying to earn points by fulfilling the winning condition, which changes with every hand and is determined randomly. The twist here is that only the dealer knows the current winning condition with the other two players attempting to guess if they can win the hand or not. The charm of the game is the tension between the bluffing of the dealer and the deducting of the other two players. With the limited information that I hold and the card that the dealer just played, do I hold the winning card or should I fold? Can I get the other two players to fold since I don’t have the cards needed to win? Sweet, sweet tension. Cards are broken down into three groups: 2 sets of cards that go from 1 to 6, one in white and one in black, and one ? card (The Mad Doctor’s Secret). 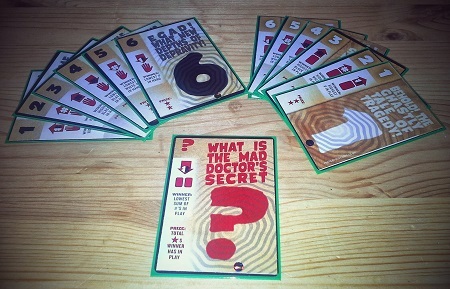 First, for a prototype, these cards look real good. No “real” art, but some nice, solid font art with some 1940s detective/horror flair to them. I wish my prototype looked anywhere near as good. Each card has two elements: a value/color combo (except for the ? card) and a victory condition, which is broken down into three elements: highest or lowest card; white, black or any color; in hand or in play. Using these three elements, 12 different victory conditions are crafted, plus a special one for the ? card: lowest sum of cards in play. Each different conditions has a victory point total associated with it (from 2 to 5) for whomever fulfills the victory condition. The rules are quite simple: deal 4 cards to each player, leaving one card which the dealer will take a look at and place, face down, in the middle of the table. This face-down card is the victory condition. Only the dealer knows this card. He then opens the festivities. Play a card to the table. You must do this on the first round. Pass and not play a card. However, you’re still in the hand. Fold and eliminate yourself from the round. Why would you want to fold? Simple: if you think you will lose the hand and you fold, you will get one point if you are right. The hand is over if everyone but one player folds, if everyone passes in a row or if the total value of all the cards played is 20 or more. Once the hand is over, flip over the winning condition card and check who, out of the players who are still in, wins the hand and award the points accordingly. Simple, no? Well, there is one more little wrinkle: the cards that give the most points? They have the toughest victory condition to achieve, and the easiest have the least amount of points. Overall, I’m very impressed with what Solis has managed to pack in such a small amount of components. The rules are very easy to explain (even though I made one small mistake the first few games: forgot about the 20 points showing ending the hand) but it will takes one or two hand to fully get your head around them. Once people understand what they are trying to do, a hand goes fairly fast, with an entire game being over in 10 to 15 minutes. The duality of bluffing when you’re the dealer and deducting when you’re not means that there is an interesting dynamic in play as you switch role: you might be really good at one, but poor at the other and it doesn’t matter since you’ll be switching very soon. The tension over decision stays high since not a lot of cards will be played (an average of 7 cards will be played per hand, with a max of 8 cards and a minimum of 4 cards if no one drops out) so that you have to be really careful. In general, you get to lay one or two cards tops per hand, which doesn’t leave a lot of wiggle room, especially when you’re not the dealer. On the flip side, games are brutally short since you only need 10 points to win and since, on average, a player will win 3.2 points each hand if he stays in and win or 1 point if he folds and was right. This little wrinkle (getting a point for folding) means that two or all players can score point during a hand, throwing off the curve a bit. While this would means that even in a very even game there would be a max of 7 hands played if the first player gets at least 1 point for folding, in reality the potential extra point make the game last 3-4 hands, with possibly be over in 2. The addition of the ? card skews the game even more in the 3-4 hand territory, with a minimum of 6 points to the winner (remember, everyone has to play at least one card in the first round) and a incredible 18 points maximum, which could mean only one hand is played. Edit: turns out I had the rule wrong: you only get the stars for the cards you play, which can still be problematic. After a series a tweets with Mr Solis, he has now tweaked the rule to state that you only get the highest star value of the cards you played. In other words, you get a max of 6 stars if you played a 3 or a 4, with a minimum of 2, which greatly mitigates this card. I’m unsure if giving only 1 point for folding when you think that you won’t win the hand is enough but then again, I’m not sure it should be given since it seems to shorten the games considerably. The risk/reward here is that unless you’re really sure, you’ll stay in since you will gain a minimum of 2 points if you do win the hand, with a max of 5, which could easily win you the game. Maybe penalize a player for folding or staying in? I know most designers stay away from taking points away from players, but it might help with the very short game issue, if it is an issue. Do I like the game? Yes and I’m pretty sure all gaming groups will like it. It’s the perfect filler when you’re waiting for that fourth player to show up. This entry was posted in Review and tagged Suspense on September 27, 2013 by TopDog.